Fix your computer, phone, or tablets (but mostly your phone) at your home or office with an outcall tech repairman. Whether you cracked the screen or dropped it in the toilet, or the WiFi just suddenly doesn’t work or the fingerprint scanner's broken or you tried to drill a headphone jack in the top, broken tech is a fact of life. Normally, you'd have to go to a service center and hand it over to some total tech-savvy stranger. What if that tech-savvy stranger came to your house to fix it in front of you, instead? We busted our phone. At first it seemed all right, but a few days later, it just stopped working completely. Uh-oh. Select your device manufacturer, model and, sometimes, color (in case they have to repair the phone case too). On the next screen, select what you'd like repaired. 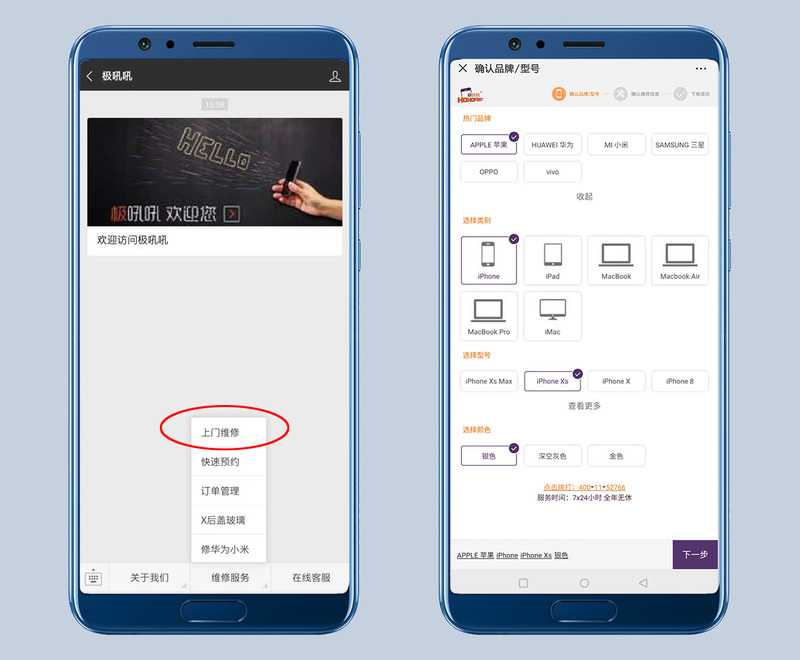 If your problem is not included on the list, you can input it in the box at the bottom (in English). Next up, select an address and a convenient time slot. They go from 7am until midnight, seven days a week, and usually with same day availability. Unfortunately, we still had to field a phone call from their 24/7 customer hotline to confirm everything, but they had English speaking operators. Our technician showed up, unfolded his little tool box and mat, and set up a camera. He recorded the whole thing on his phone. A legal precaution, they said, in case he messed it up, possibly a result of China-shock headlines from August, when an iPhone they repaired earlier that year burst into flames after being left out on the dashboard. Good time to point out that repair services in Shanghai are often unauthorized, but also leaving your phone in the sun is a bad idea. Evidently we busted our phone too much to fix on the spot: the phone would need a replacement motherboard and a new battery, so he said he'd need to take it back to the service center. It took about three days to get the phone fixed, and he brought it straight back to the office for us in pristine condition. So, we didn't succeed in getting our phone fixed on location, but we didn't have to leave the office at any point in the process. Ed's Note: They asked us to provide our Apple ID and our password so they could check if the repair took. We didn't feel comfortable giving that out, so we said no, and the technician came to our office for us to input the code and then run the check. Replacing a motherboard cost 400rmb, and a replacement (third-party) battery cost an additional 99rmb. No additional charge for delivery or the initial consultation. The phone has, thus far, not exploded. There are a lot of other outcall services that range from guys who normally run a stall at the cybermarket to larger companies like Hoho Fast. Here are two alternatives we spoke to (but haven't tested ourselves). These guys mostly repair iPhones and tablets, Oppo, Vivo, Huawei, Samsung, Meizu and Xiaomi phones. No computers. If it's water damage, the motherboard is broken or the phone can't switch on at all, you'll have to head into one of their two centers to get it repaired. 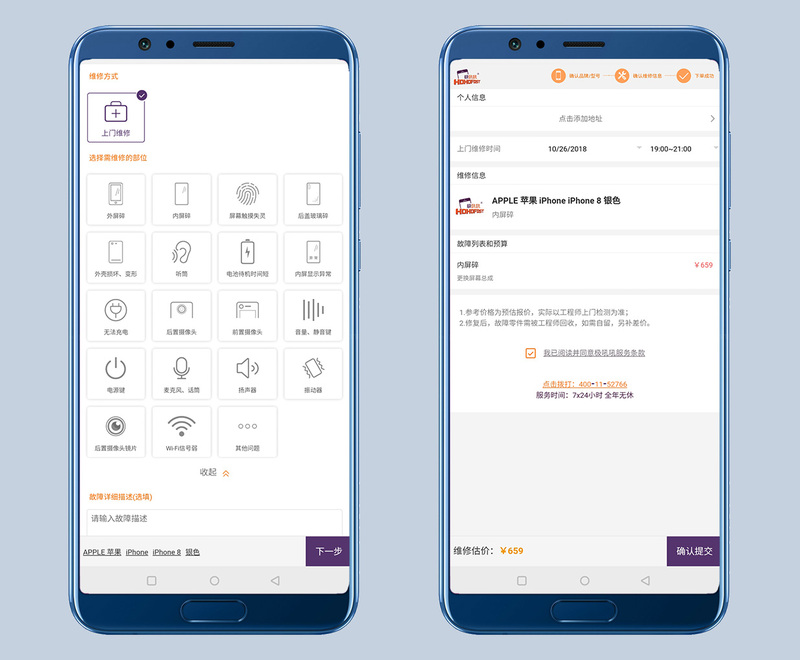 You have to call into the service hotline and they'll check if your address is covered, but they visit most areas out to Songjiang and Yangpu. They had a small handful of English-speaking technicians when we checked. There's no visitation fee, and it's 500rmb to replace the external screen on an iPhone X. They give you the option of official replacement parts, which are more expensive, or knock-off replacement parts, which are significantly cheaper. There's an automatic 180-day warranty after the repair. This one's a Chongqing-based company but they operate over most of Shanghai. 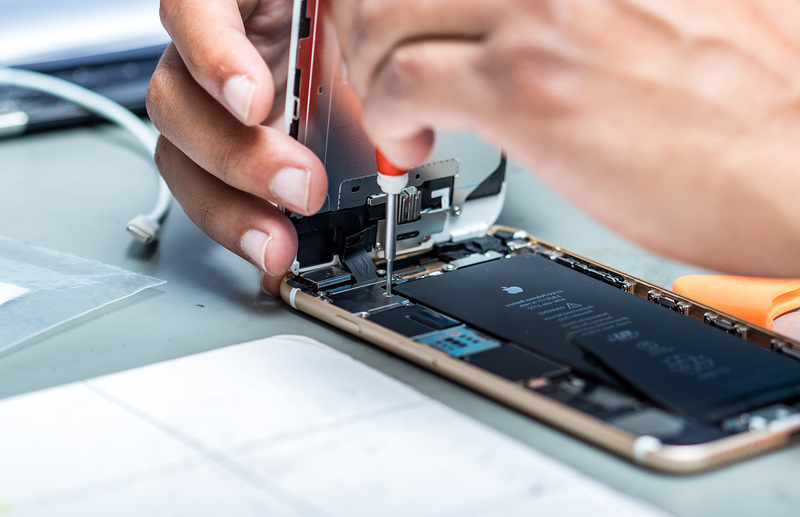 They'll repair most Apple products except iPhone Xs and X2 because they're "too new," and a host of phones (Oppo, Vivo, Huawei, Samsung, Meizu and Xiaomi). For laptops, they'll collect it and take it to one of their two service centers for you. The website's quite easy to use. They also have a handful of English speaking technicians you can call and arrange for. Don't expect much beyond basic communication. There's no door fee (unless it turns out nothing needs repairing, then there's a 49rmb "consultation" fee), and fixing the external display on an iPhone X will cost you about 770rmb. - Outcall tech repair is mostly for phones. - They might still have to take your phone with them anyway. - Choose third-party replacement parts at your own risk. - They won't install a headphone jack in your iPhone.